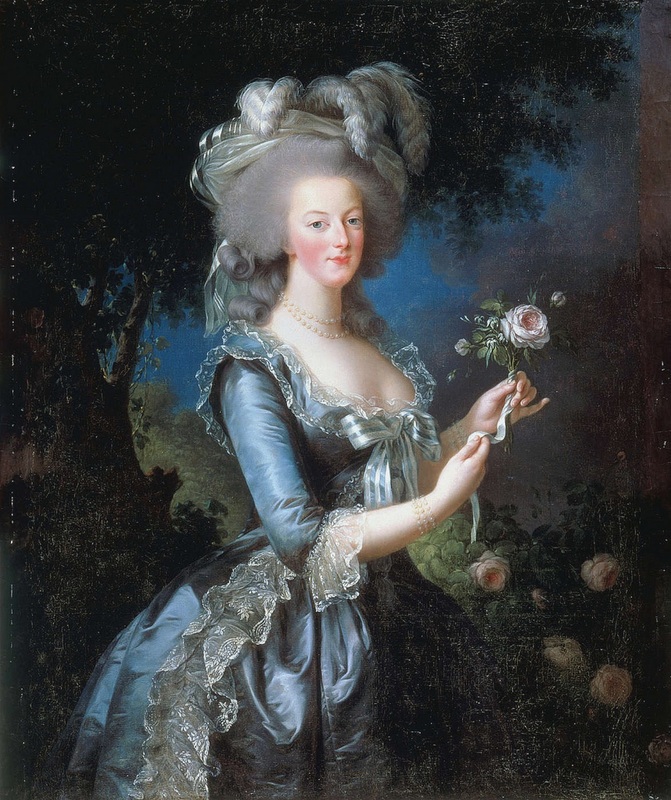 So, I have a secret confession- I have a slight obsession with all things Rococo and Marie Antoinette. For me, there is something so luxurious and beautiful with the decadence that is associated with the Rococo time period. The artwork created at the time depicts such a soft and elegant frivolity, and the colors are just so lovely and delicate. The clothing is so sumptuous and over the top you can’t help but feel the luxury that surrounds it! 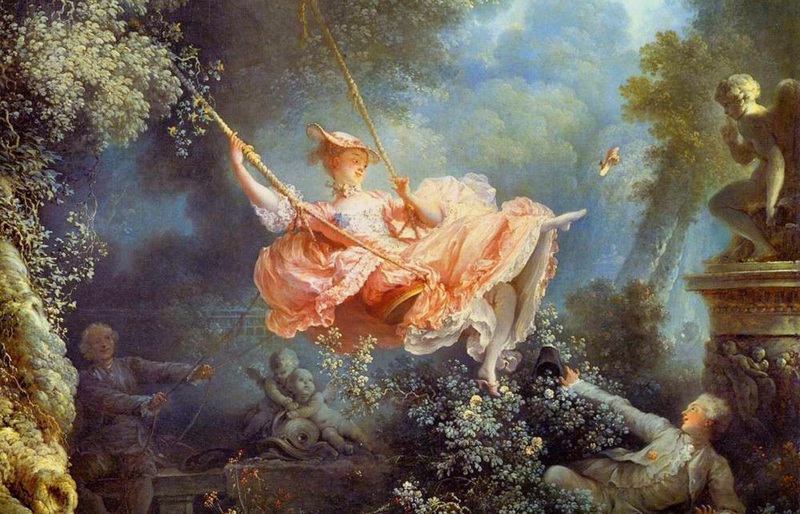 It’s easy to see the elegance of the time in this painting (above) by the artist Jean-Honoré Fragonard called “The Swing“. Can’t you just feel the playfulness the image evokes? I just LOVE how the woman’s shoe is just flung off of her foot, and she seems to have no other care in the world other than just enjoying her moment with her companion. 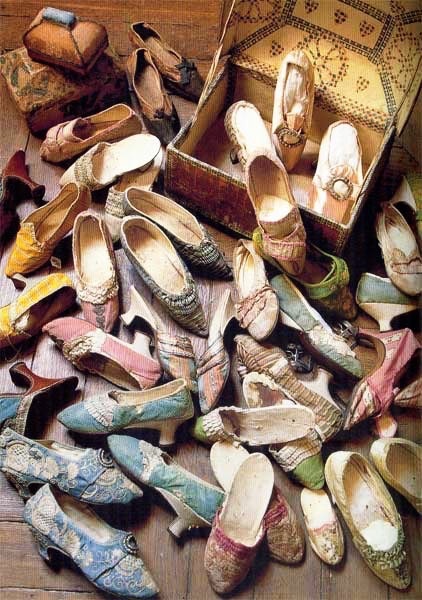 During my 18th century clothing research, I found this image of a huge pile of shoes that were thought to be from Marie Antoinettes personal collection! Now that’s a woman after my own heart! I just love the multitude of colors and variety of styles that she had in her collection. Needless to say, I was inspired! I had to make a pair! Take my love for costume design and Art History, as well as my knack for repurposing old things, and we’ve got a recipe for a great DIY project! 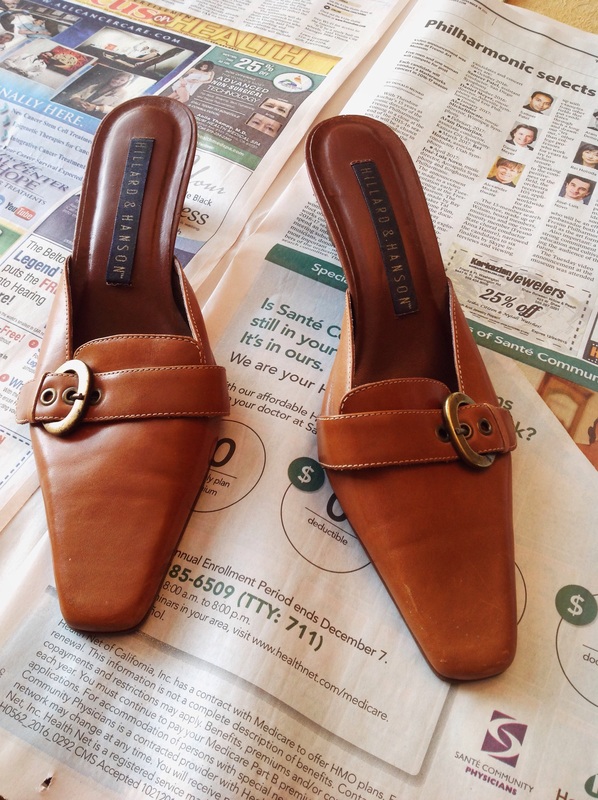 First, I found a pair of shoes that had a similar shape to the shoes of that period. 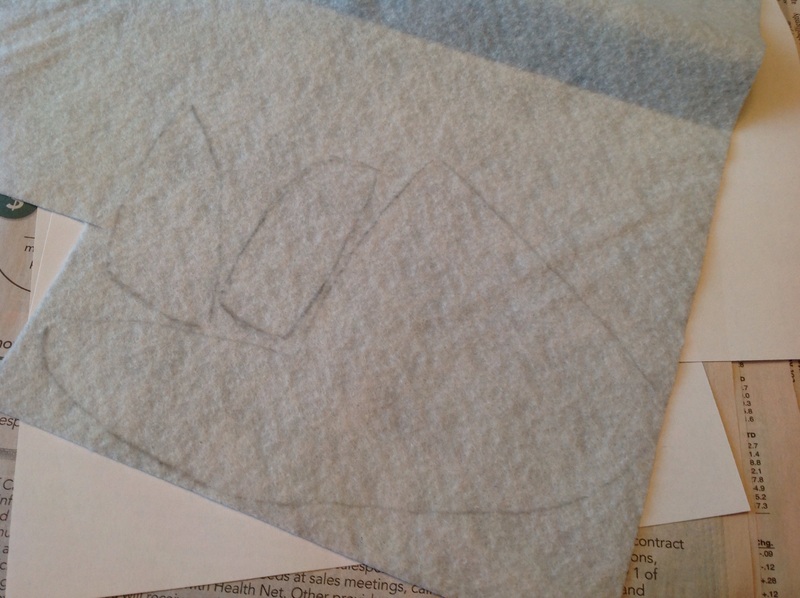 I opted again for working with a leather, but didn’t do much altering to the original material that was already there. Next, I decided to make a cloth pattern because I felt it it would be easier to manipulate the soft blue vinyl material I picked to cover the shoes if I made a “pattern” first. 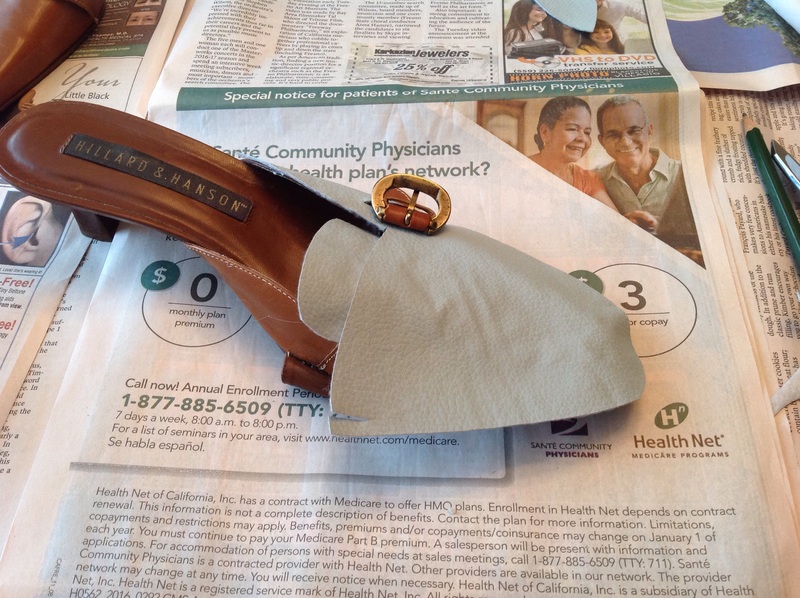 Then, after I manipulated the pattern enough to fit the shoe well. I transferred it with a pencil to the back of the vinyl material. 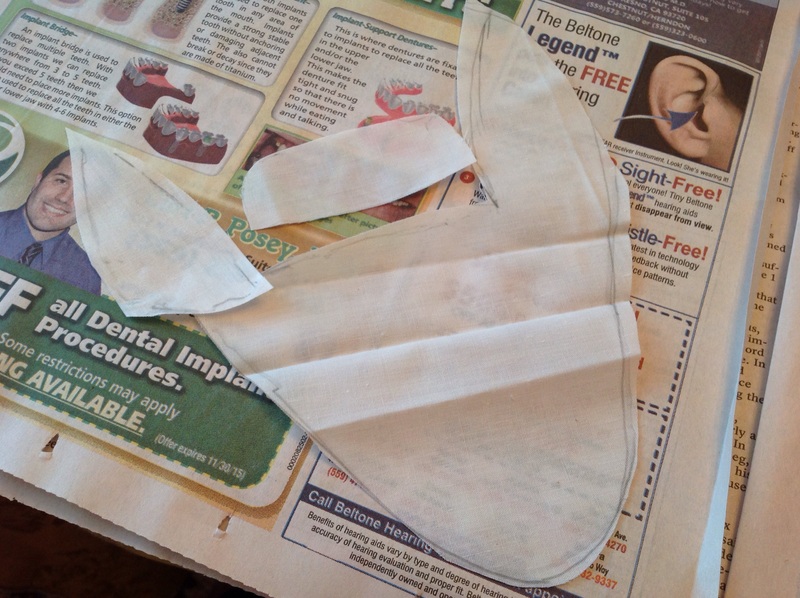 I also made sure to flip the pattern pieces over and transfer the “mirror” of the pattern for both shoes. I then cut out the “pattern” from the blue vinyl material, and using my hot glue gun I carefully glued each piece on, smoothing the material from the center out toward the edges, making sure to smooth any lumps out. I decided to utilize the strap and buckle that was already on the shoe because that is what had originally caught my attention on these shoes, and it is very “a la mode” for Rococo fashion. Plus they are in the perfect place to hide the seam between the tongue and the top front of the shoe. Since I didn’t remove the strap, I had to make sure I cut a slit in the side if the blue vinyl that would allow the large buckle to fit thru. Once all of my blue vinyl was securely in place, I decided to “guild” my straps and heels in a metallic champaign paint. I originally had picked a metallic copper color, but that color was really close to the original brown color of the shoes, and it didn’t stand out as much. So I went with the beautiful champagne color instead. 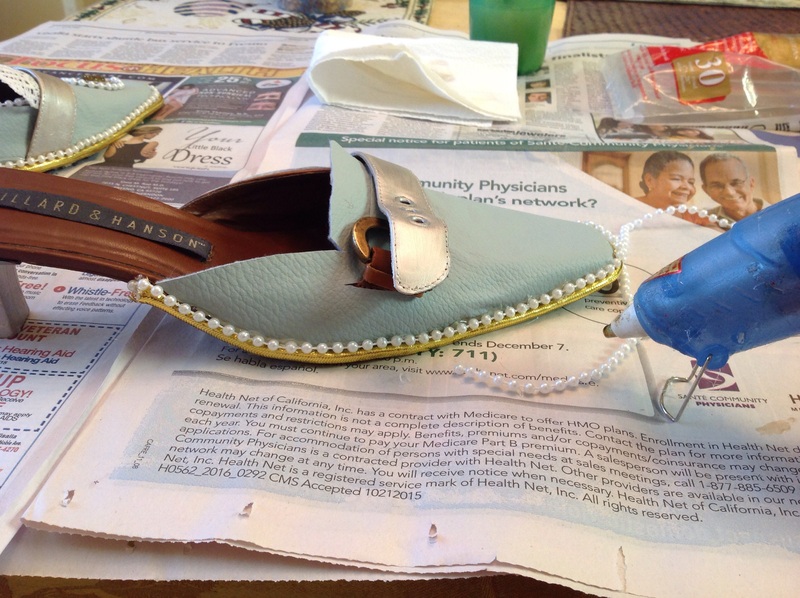 I added a gold rope trim as well as a pearl trim around the outer edges of the shoes and around the upper part of the heel. 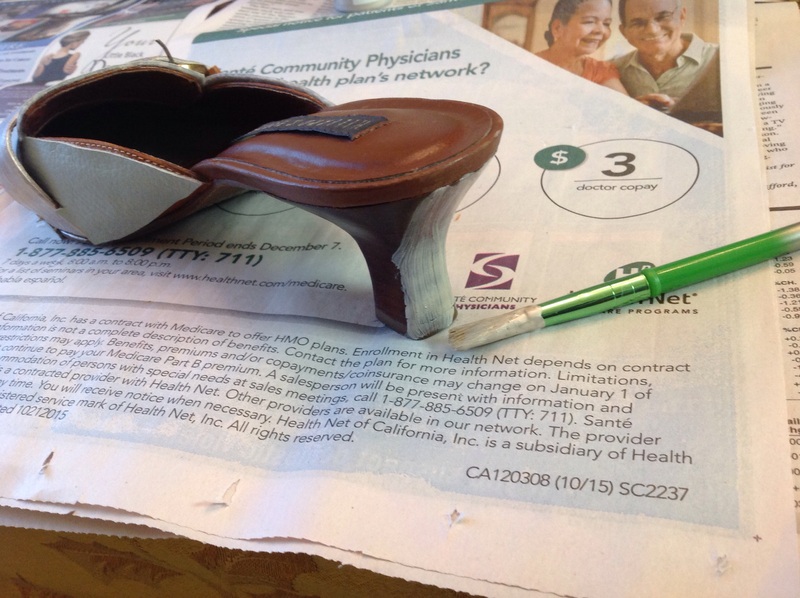 I then added a lovely bit of lace on the tongue to soften up the look of the shoe. 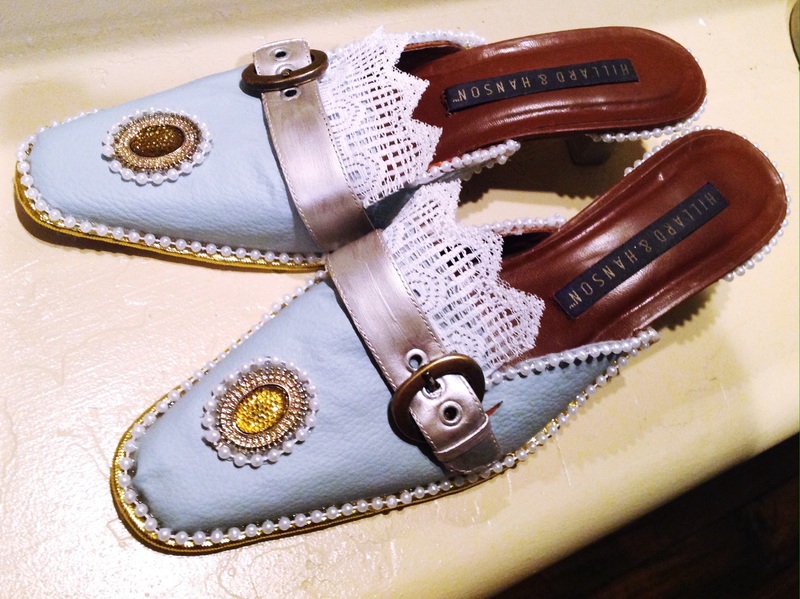 For the final touch, I added a gold and brown jeweled accent (made from a pair of earrings) on the top of the shoes, and “encrusted” the outer edge with the same faux pearl I had already used on the shoes. 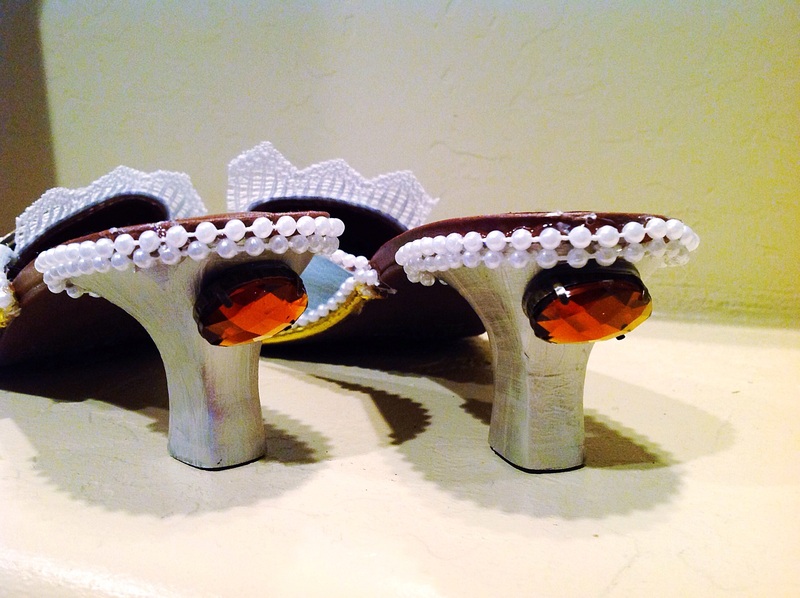 I also added a huge and gaudy brown “jewel” on the back of each heel. The fake gems are not a traditional accent for shoes of the Rococo period, but for me it adds that over-the-top affluence that is associated with Marie Antoinette, and I just liked the way they looked. 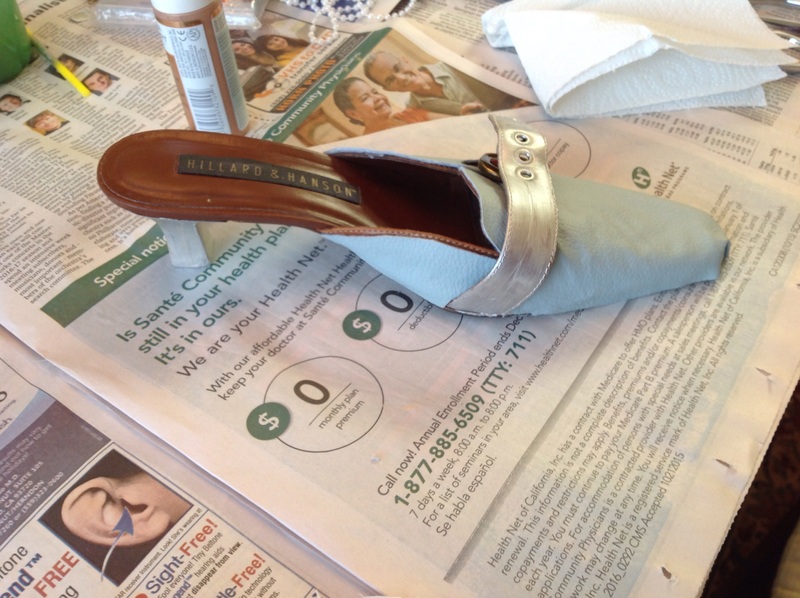 Here are the finished shoes! What do you think? I LOVE them! Now I just need to make a gown to go with them… I’m thinking this one would look really nice.